Even though I have so done so many questions and attended all the revision classes, I am still not very satisfied with my performance. So, I will be doing some last minute drilling from now and hope that I will not be distracted (trying really hard for this 😅😅). And so, I am very sorry for leaving until then. I will be sure to post a few things (and hopefully a few videos) after the finals. Hey, it's been a while since I last posted something about manga. 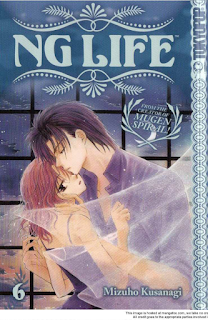 This time I found a good one, written and illustrated by Kusanagi Mizuho. This manga artist is quite a famous one, I would say. She is the author of Akatsuki no Yona, which is a hit manga. However, today, I'm not going to write about this manga, but another manga, which I think it has quite a unique storyline. About: This story revolves around a high school guy, named Keidai Saeki, who unlike others around him, remembers about his past life. He always remembers about the past and gets messed up with those who have been reincarnated as his friends and family. What's more to this story is that the one he always longs for, his wife in his past life, reincarnated as a middle school boy living as his neighbour. This leads to a series of drama and comedy.